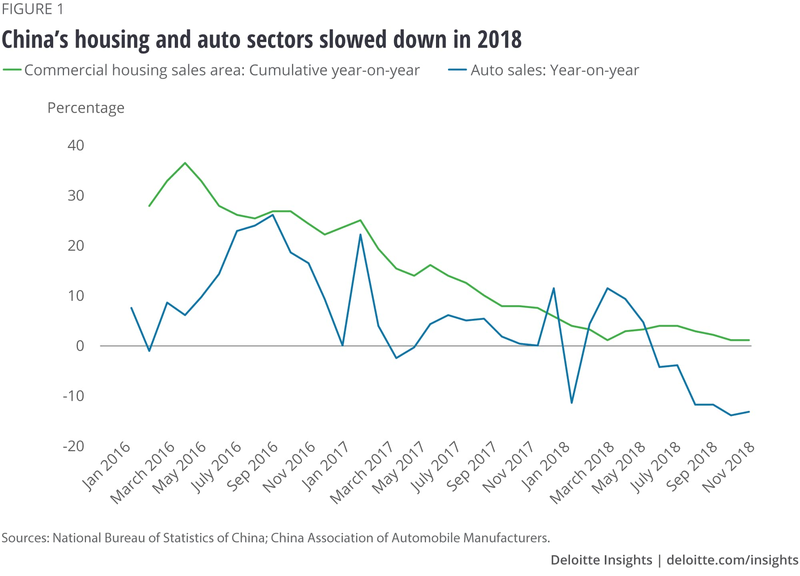 The end-of-year slowdown in the housing and auto sectors (figure 1) may well prompt policymakers to introduce a fiscal stimulus package simply to kickstart economic growth. This is because stagnation in the market is a far greater worry than worsening affordability for policymakers. But when it comes to the auto industry, whether the government will unveil more tax rebates there too really depends on the outcome of the next round of US-China trade talks. So far, Washington has continued to defer its plan to raise the tariff on $200 billion of Chinese imports to March 2, while China is going ahead with its rollback of tariffs on US cars and auto parts.4 In addition, China has stepped up the purchase of US soybeans and other agricultural products.5Given these encouraging signs, it is conceivable that a truce may be on the cards in Q1 2019. Moreover, if the US equity market turns bearish owing to fears of a possible slowdown in China (think Apple's recent announcement6), President Trump might be more inclined to strike a deal with China. So far in 2019, the renminbi has performed strongly, as a result of the ongoing trade talks. Even a temporary suspension of conflict would improve the rather subdued sentiment in China and the region, triggering equity rallies and bolstering battered regional currencies. Unfortunately, the renminbi exchange rate is often affected more by politics than by economics—the decision taken by Beijing to keep the currency stable during the Asian financial crisis (1997 to 2002) propelled China into a position of leadership in the region. As long as trade talks continue, Beijing will be likely to keep the renminbi exchange rate steady as a gesture of goodwill. Meanwhile, the fact remains that despite the various mechanisms that enable the People’s Bank of China (PBOC) to have a managed floating exchange rate regime, policy biases have been increasingly favoring a stable renminbi exchange rate since the second half of 2018.9 Rightly or wrongly, an exchange rate of 7.0 RMB to the USD is being seen as a key psychological threshold10 in terms of confidence even though the PBOC’s reserves stood at $3.07 trillion at the end of 2018.11 This was why USD/CNY ended at 6.99 in 2016 amid mounting depreciation pressures. The real issue is whether a stable renminbi exchange rate would come at too high a price—that is, lead to sub-par growth or become a drag on corporate profitability. Our long-held view is that China does not need a major revaluation of the exchange rate in order to restore competitiveness. However, a slightly weaker renminbi will support the PBOC's accommodative monetary policy and reduce some of the pains of deleveraging.